Throughout a busy business day with customers coming and going, your business’ parking lot can get dirty. Dirt, twigs, paper garbage, bottles, and other debris can make your parking lot look unsightly. Our professionals sweep the parking lot and remove all garbage to make your property look clean and polished again. This service also keeps dirt from building up and leaving a film on your shoes. We clean up so you can focus on your business. ABC Landscaping & Sweeping are experts in snow removal and traction control. We understand the legal liabilities a company is subject to should a customer slip and fall or damage their vehicle on your property as a result of slippery ice and snow. We are insured for those liabilities so you don’t have to worry about them. Our on-time and reliable team monitors snow forecasts and are on-call during inclement weather. We plow, haul, and shovel snow, as well as apply industrial grade ice melt to remove slippery areas. Our Farmington landscapers offer commercial pressure washing, specializing in flat service cleaning of concrete and asphalt. We also have the tools and cleaning solutions needed to remove unsightly pieces of gum from your property. 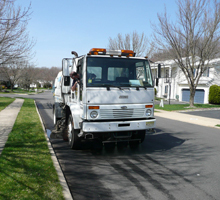 Our surface cleaning heads leave the cement stripe-free; ensuring the surface looks even after our work is complete. Our machine is rated up to 3500 pounds per square inch and up 220° F. We also clean exterior building walls and windows, including construction site clean ups. For the professional cleaners at ABC Landscaping & Sweeping, no lot is too big or too small for our property clean-up services. We remove debris, haul away junk cars, and get rid of self-seeder invasive species plants. We also provide fire mitigation to accelerate the restoration of the property. We provide commercial landscaping services, including sprinkler installations to suit the needs of any sized property. We plant perennial and annual flowers, scrubs, and other plants so your business looks lush and beautiful year-round. Our landscapers also provide repairs, including but not limited to replacing diseased plants and filling in bare patches of grass. Our commercial landscaping maintenance services in Farmington include weed spraying and removal, fertilizing grass and soil, and pruning of trees and scrubs. We also clean up undeveloped areas of brush, leaves, and debris. We trim trees, scrubs, and brush, working in retail complexes, golf courses, and plazas.